'There's not such thing as a free lunch,' says Defense Min, following report US will ask Israel to withdraw from Jerusalem neighborhoods. 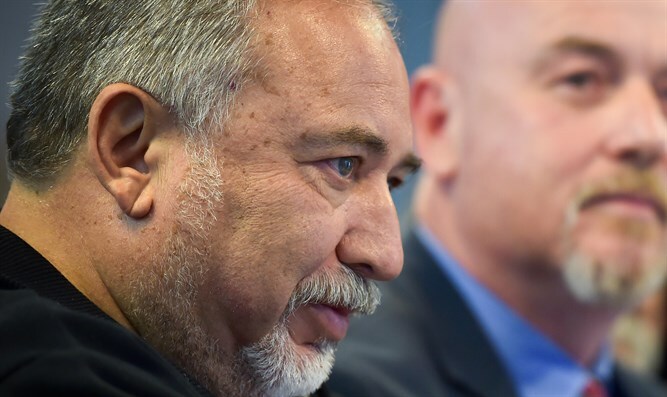 JTA - Israel’s Defense Minister Avigdor Liberman said that Israel will have to pay “a price” for the U.S. decision to move its embassy from Tel Aviv to Jerusalem. The Jerusalem Post reported on Friday that U.S. officials told Liberman during his visit to Washington last week that the Trump administration plans to ask Israel to withdraw from four Arab neighborhoods in eastern Jerusalem – Jebl Mukabar, Isawiya, Shuafat and Abu Dis – and transfer control to the Palestinian Authority in order to make the area the capital of a future Palestinian state. U.S. officials later denied the report, saying the U.S. peace plan is not completed. Liberman also called the decision to move the embassy “historic, important and dramatic.” He said during the Saturday night broadcast that he believes that there could be attempts to disrupt the mid-May celebration of the embassy move, but does not expect casualties. The March of Return on the Israel-Gaza border is scheduled to climax on May 14, the day of the embassy dedication, which maks the 70th anniversary, according to the Gregorian calendar, of the birth of the modern State of Israel, though Hamas has called for the protests to continue beyond mid-May. With about a week to go before the inauguration of the embassy, which will include a ceremony attended by about 1,000 guests, including a delegation of 250 from the United States, it still is not known if President Donald Trump will attend. The delegation is reported to include at least 40 members of the Senate and House of Representatives, as well as Trump son-in-law and advisor Jared Kushner and the president’s daughter and advisor Ivanka Trump, and special Middle East peace envoy Jason Greenblatt. It was initially said to be led by Treasury Secretary Steve Mnuchin, who is Jewish. The new embassy initially will be housed in southern Jerusalem, in the Arnona neighborhood, on a compound that currently houses the consular operations of the Consulate General of Jerusalem. Site selection and construction of a new embassy will take up to nine years.